Signs of spring are popping up everywhere I look. The snow has finally melted, ambitious little green shoots are sprouting up, and I’ve been digging through my closet, banishing every last wool/heavy/dark/drab item from my wardrobe. Yes, spring is here, and it’s the perfect time for spring cleaning, new beginnings, and finally getting around to putting my blog on Facebook. You heard right! I’m slowly, but surely, wading into the quickly moving current of social media atop my little blog raft. I was hoping that maybe, just you know, if you’re not too busy (and I’m already so appreciative that you stopped by here!) that perhaps you could pop over to the Book of Faces and *like* Feeding Your Beauty? I feel so awkward asking you all to like me, but… please like me?? I would be awfully grateful! I would also be more than happy to return the favor. I have future plans of FYB joining the friendly faces on Instagram and Pinterest, too. Maybe even Twitter. One thing at a time though! I am embarrassingly slow at embracing new forms of communication/technology. I will let you know if and when I do, and I’ll surely need your support and encouragement! Also, you may have noticed Feeding Your Beauty got a fresh, new, mini-makeover. I am pretty excited to change the look of the blog, it feels a bit more clean, simple, and bright. I’m hoping around the one-year mark, later this fall, to make some bigger changes. For now, though, it was just the sprucing and tidying up it was craving. Energy bites. Fudge balls. Truffles. I wasn’t sure what to name these little darlings, and as you can see from this post’s title, I was already getting a little long winded. All I know is, they are so. dang. good. They are melt-in-your-mouth chocolate-y and oh so coco-nutty with sweet n’ sour chewy chunks of dried cherry and crunchy bits of raw cacao nibs. They are that just-right bite of sweet that I go foraging for after dinner, or in the afternoon when I need a little pick-me-up. Besides being a total flavor party in your mouth, I love these little treats because they don’t require a food processor. 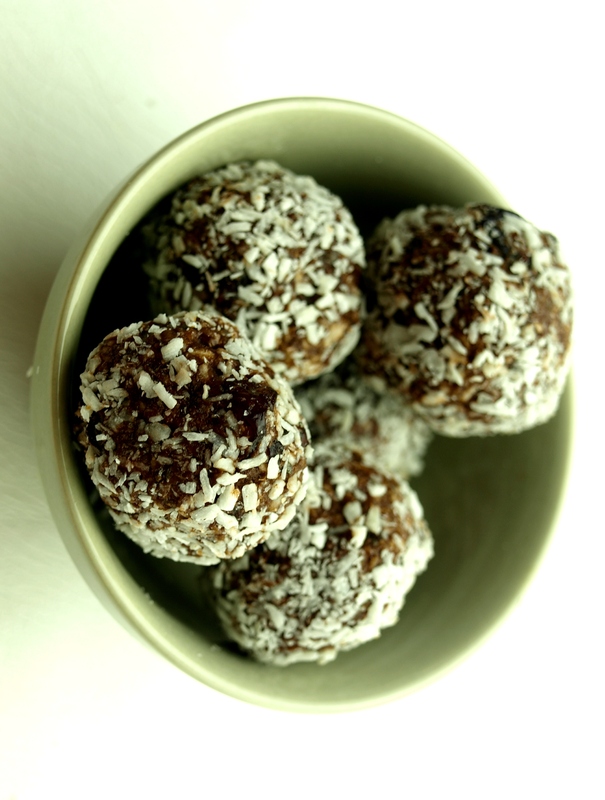 I adore traditional energy bites made with all kinds of seeds and raw nuts and dates. These are great snacks when I have the forethought to prepare them ahead of time. Later in the evening, however, after my toddler is tucked in peacefully, the last thing I’m going to do is lug out my 8 cup food processor and start grinding away at some whole almonds and dried fruit. Enter this recipe. 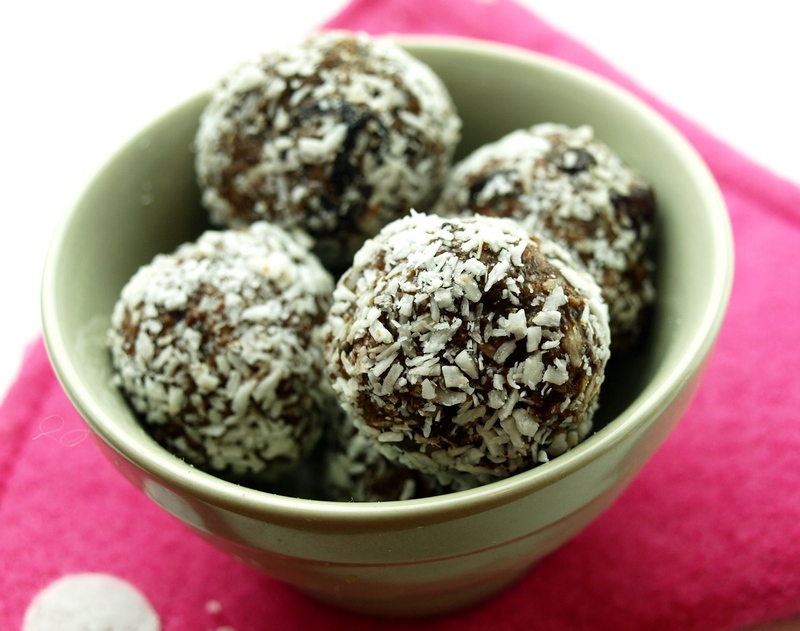 Whether you’re sans food processor, or there is a sleeping lion, er baby, in the house, these are the perfect, easy, healthy treat. Also, did I mention they are good? Like maybe the best flavor combo in the history of energy bites. I love the sesame seed zing from the tahini combined with creamy almond butter, rich cacao, chewy coconut, and tart cherries. Now excuse me as I (quietly) go make another batch. 1. In a small pan over very low heat, melt the coconut oil. Stir in the almond butter and tahini and remove from heat. Add the cacao/cocoa powder, maple syrup, chia seeds, 1/4 cup of coconut shreds, cherries, and cacao nibs. Stir very well. 2. Scoop the mixture into a glass bowl and place in the freezer for about 10-15 minutes, until the mixture has firmed up. 3. 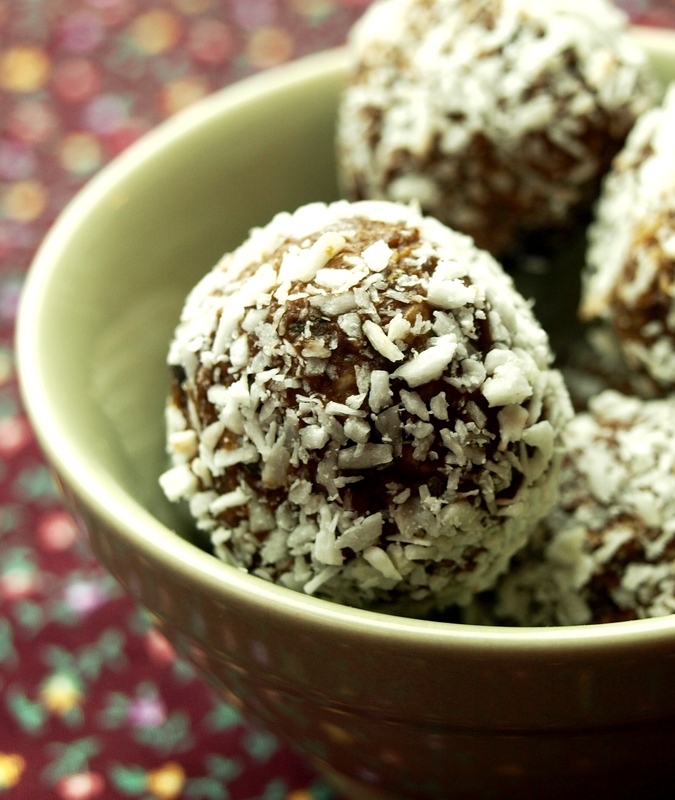 Using a tablespoon, measure out small scoops and roll them into balls, then roll into the coconut shreds, coating the bites. Store them in the fridge or freezer. 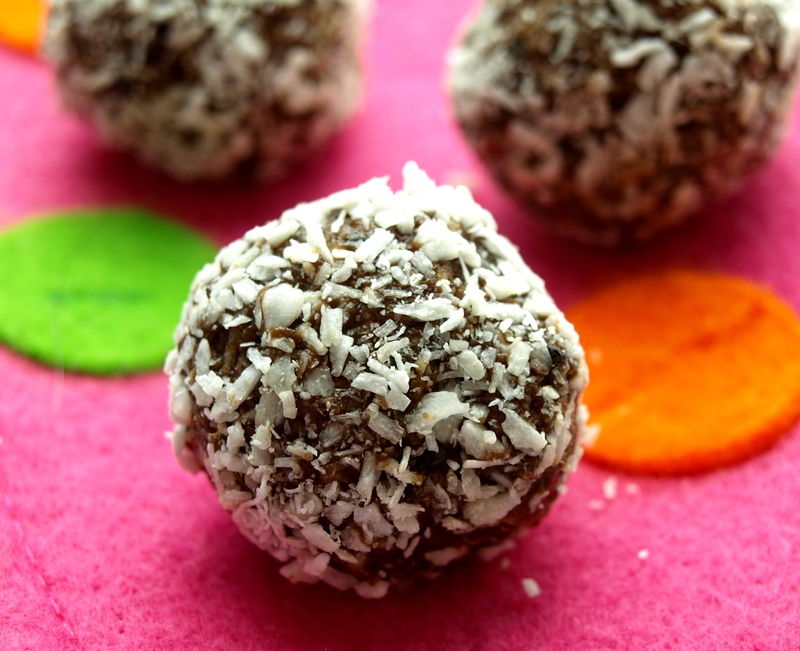 *For coconut-free bites, use finely chopped raw almonds in place of the unsweetened coconut shreds. Please let me know if you do! I’m kind of addicted to them!